A spoon with a question on it has set me off on a historical search. The spoon is a wavy handle Shepard Manufacturing Company state series spoon with "Michigan" and the state symbol and a tree. I quickly figured out that the spoon was referring to St. Joseph, Michigan. But why a cupid and why did it make St. Joseph famous? 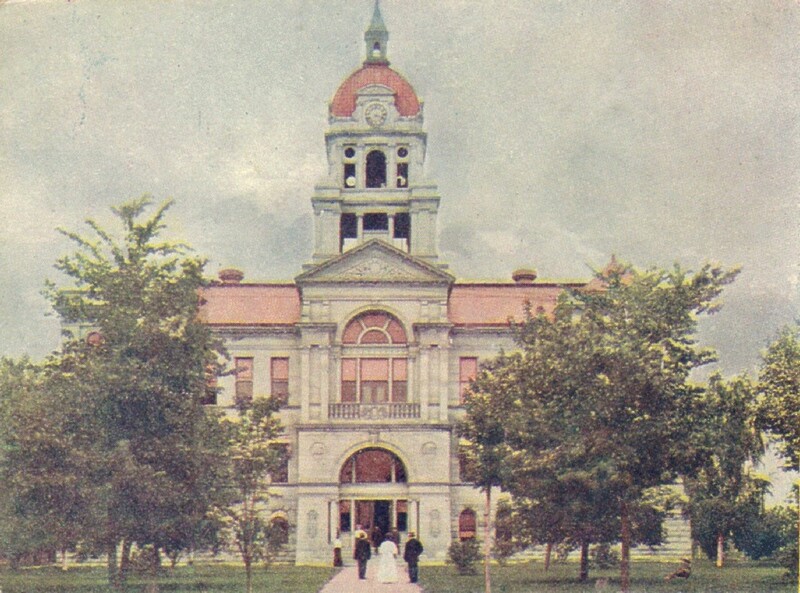 Apparently there was no waiting period (as was the case in most jurisdictions) from the time that a marriage license was issued until the ceremony. 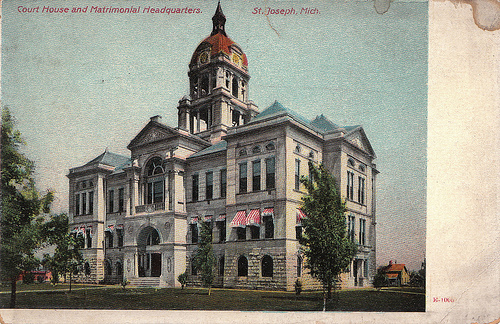 Since St. Joseph was also a nice resort area with the famous "Silver Beach" and amusement area and a number of luxury hotels, it became a popular setting for weddings and also was an inducement for people from nearby areas who wanted to elope. 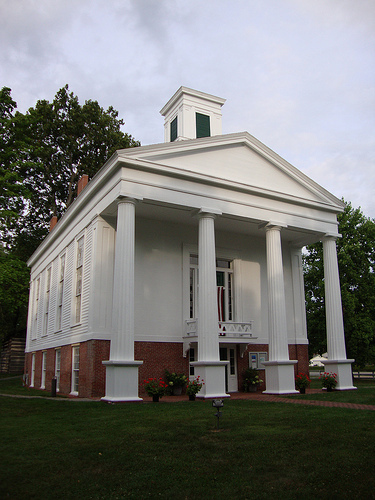 Ceremonies were also held at the courthouse. 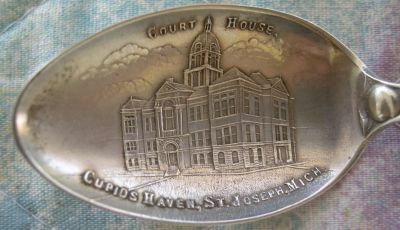 Then I discovered that I had a spoon showing the St. Joseph Court House and it was also labeled "Cupid's Haven"
At first, I thought these were apples, but I did some further research and the leaves appear to be peach leaves and peaches do have a small dent in them. However the area around St. Joseph is known for its fruit trees which includes both peaches and apples. I did find this information, "Surprisingly, Michigan's first commercially successful fruit was neither the cherry nor the apple, but the delicate peach. By the mid-nineteenth century peaches made Berrien County one of America's great fruit producers." by William John Armstrong. note: peaches on souvenir spoons are very rare. 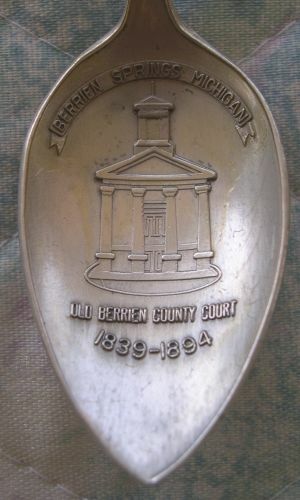 This spoon is not the typical quality which we normally see in souvenir spoons because it was made in 1974 as part of a centennial celebration of the old court house. Obviously they did not want to put the money into a detailed embossed picture as they did in the old days, and there are very few engravers who can do the quality engraving work which we typically find in souvenir spoons. On the front small pictures show the "EMC south hall" "Battle Creek College" a picture of an "inter urban" train and the words "Andrews University"
On the back the small pictures show "AD. Bldg Nethery Hall", "Pioneer Church", "seminary" and a small bird. The back of the bowl is engraved "Centennial 1874 1974" in block letters. St. Joseph in that year. 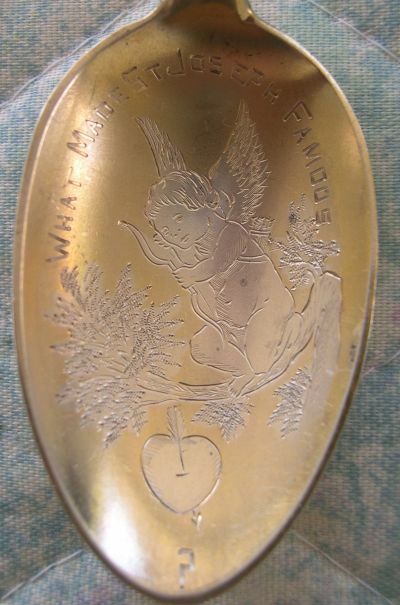 I do not know if this cupid spoon is related to this discussion, but it is a nice example of cupid on a sterling souvenir spoon. Note the intertwined hearts at the top and the arrow down the handle. Manufactured by W.C. Finck, Co. of Elizabeth, New Jersey between 1896 and 1904.